SnapRays Guidelight LED nightlight outlet cover. Leaves both outlet plugs free. Has a light sensor that turns the nightlight off during the day. Available in both duplex and décor outlet cover styles. Easy to install in seconds by snapping the cover in place. Uses only about 5¢ of electricity a year. Allen Lyle: Hey, let’s talk nightlights for a minute. They’re convenient, particularly if you’ve got kids in the house, maybe you make a midnight trip to the bathroom to the kitchen. In my case it’s the same. Very convenient. There’s some minor inconveniences, for example if they block one or both of the outlets. Even if they’ve got an outlet built into it and you try to plug into it, you’ve got to hold onto it. I can’t tell you how many times I’ve knocked mine off with the vacuum cleaner. Well, here’s something new. We’re talking nightlights and we’re talking about this—it’s an outlet cover. I’m torn on this. I love it—there’s your nightlight right there—it’s simple, but it’s the genius of the design. I’m ticked off because I didn’t think of it. This is one of the coolest things here. This is how you install a nightlight into the outlet. You take the old cover off, take the new one on, pop it in place. It’s that simple. You put the screw back in. You can actually install this yourself in seconds. You don’t have to worry about electricity, none of that. These lights—beautiful lights—you can actually put them where you want to. Also, designer plates so you can do not only a plug but a switch outlet. Now the cost. Keeping in mind that you’ve got lights on, so it’s going to cost you money. How much, you may ask? On average across the United States if you run this 24/7 for an entire year, it’ll probably run you all the way up to five cents. Yeah, a nickel, that’s it. This is a fantastic design. Again, I wish I’d thought of it. It’s SnapPower, that simple to install. Where can I buy local ?? Do they pull the power from the side screws? 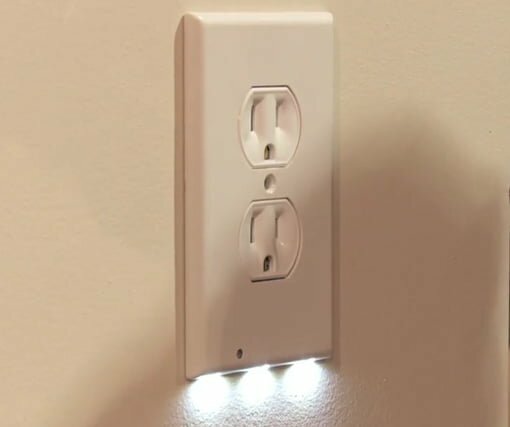 Where can I find LED night light outlet covers?